Hello there! Grab yourself a beverage because this is probably going to be a long post. I don’t want to drag things out but I thought that the best use of time and writing would be to divide Mt. 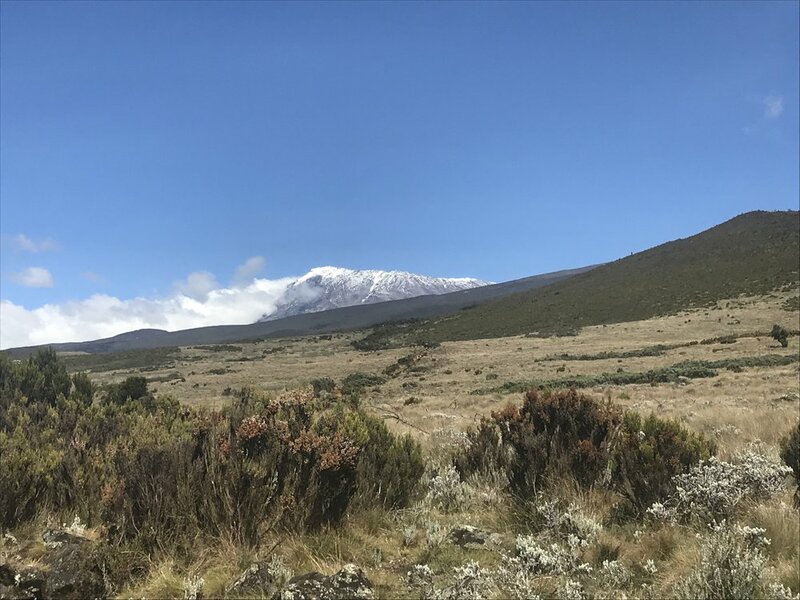 Kilimanjaro into three posts: from the gates of Mt. 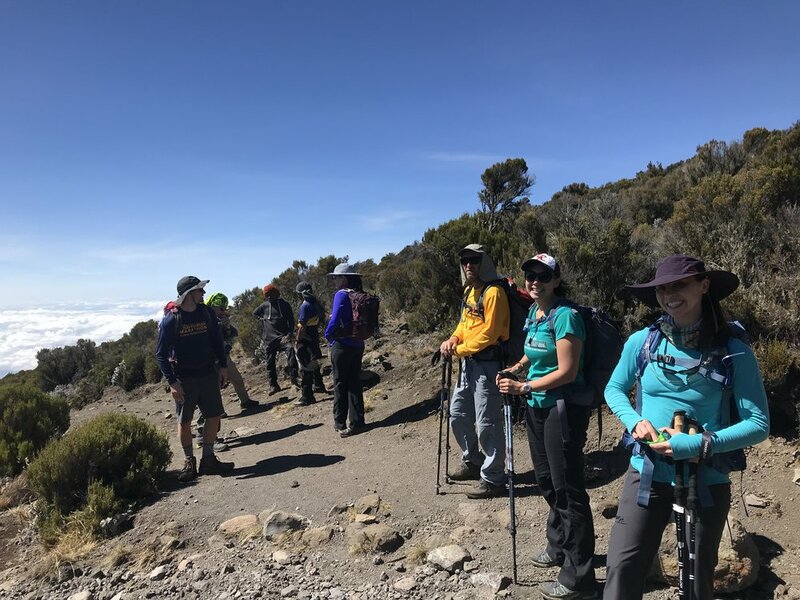 Kilimanjaro national park to the highest huts (Kibo), summit day, and finally the descent back to the gates. I’ll mention this is in each post but that means the first post (today) covers four days, summit day covers ten hours, and the descent covers a day and a half. First things first, we arrived to Kilimanjaro National Park, ready to go and pose in front of signs. Look how clean we look! I also don’t know why but it seems like 3 out of four of the women on the trip were color-coordinated in some way every day. Day 1 it was pants and I think Lisa matched us really well too. Zoe, me, and Karlie posing by the first sign we encountered before we got started on our hike! The first day we hiked to the Mandara huts, where we spent our first night. This part of the hike was warm and oftentimes hot. Though, at the very beginning (that photo) it was overcast, still morning, and there were misty, low-lying clouds that were blocking the sunlight and keeping it cold. I kept taking my fleece on and off - obviously it was off for that photo. I think it took us about 4 hours to reach Mandara the first day because we stopped for our lunch and for a few restroom and water breaks. While hiking, every day, the kitchen staff would leave before us to get to a snack or lunch point and make sure food was ready for us when we arrived. It was never a rushed meal either, the guides and staff were really great about making sure we had adequate water and food breaks, stopping when we asked so we could adjust a backpack, or find a place to use the bathroom, etc. REI hires excellent guides and support staff. The A-frame buildings in the background are the huts we stayed in at Mandara and Horombo (the middle elevation huts). They had four bunks on each side and each building housed eight people total. So our group of 8 split up into 4 and 4. Lisa, Zoe, Karlie, and I always shared a hut. John, Jody, Mark, and Greg shared a hut most of the time and for two nights at Horombo, there was space for John and Jody to have their own hut. Mandara huts greeting sign, we made it! At Mandara, we were still fairly low in elevation, the sign above is in meters but we were at approximately 8900’ above sea level. That is still high, but my point is that we had primate friends at this camp and some scary tree rats that shrieked at night and were the size of beavers. We definitely went to the bathroom in pairs at night. It was very dark and we had to wear our headlamps because we could not see anything without them. My fear was that one of those scary rats was going to jump out of the tree and land in my path and that my startled scream would wake up the entire camp. I also think it seemed extra dark at Mandara in comparison to higher up the mountain, and that we could not see as many stars at Mandara because the trees were really tall and we were in the forest. A few of us nerds kept joking that we were on Endor, the Ewok planet in Return of the Jedi. Moving on! Views on our acclimation hike above Mandara. Most wake ups before summit day were between 6:15 and 7. We just didn’t need to get going super early. I also want to note that most of the time we went to bed around 8 pm, the girls hut did anyway. I know the guys were waking up earlier than us to watch the sunrise and staying up later than us hanging out with all of the staff or just talking and looking at the stars, but we were exhausted and slept and organized ourselves for the next day. Or, we journaled or read books. But the wake ups were my favorite part of the day. Jimmy, our waiter, would knock on our door and greet us with hot water and hot towels and coffee or ginger tea, good for the stomach issues brought on by the altitude. After waking up, we’d get dressed, put on sunscreen, go brush our teeth and get ready to head to breakfast with the entire group. We’d all chat at breakfast, poke fun at the other groups, all goodhearted, who were all from Switzerland but spoke German so we called them the Germans the first day and that stuck through the whole trip, and we usually got a verbal rundown of the schedule for the day from Rashid, the head guide. The second full day of hiking was from Mandara camp to Horombo camp, so from 8900’ to over 14,000’ in elevation. Horombo was where we stayed the most nights of the climb, 2 nights on the way up and 1 night on the descent. It was my favorite camp because of the weather, the layout, the sunset and sunrise views, and because of our comically dangerous hut stairs (you’ll see below). It was where most of us were still feeling great and where we had the most social time. At Horombo, there was one large bathhouse for the women and one for the men. Each had one western toilet (and the last one we’d see once we left and headed farther up the mountain) but the men didn’t have a toilet seat. So the guys were constantly joking they were going to steal ours in the middle of the night. There were also two shower stalls in each bathhouse at Horombo with the COLDEST WATER I’VE EVER FELT IN MY ENTIRE LIFE. GLACIAL COLD. I think it actually came from the glaciers that are still up there on the top of the mountain. I took one shower there and decided I didn’t need another until we were off the mountain, and I was not the only one who made that decision. The first morning we woke up at Horombo, we had a later wake up, our morning camp routine, breakfast, then we set off for an acclimation hike to Zebra Rocks. 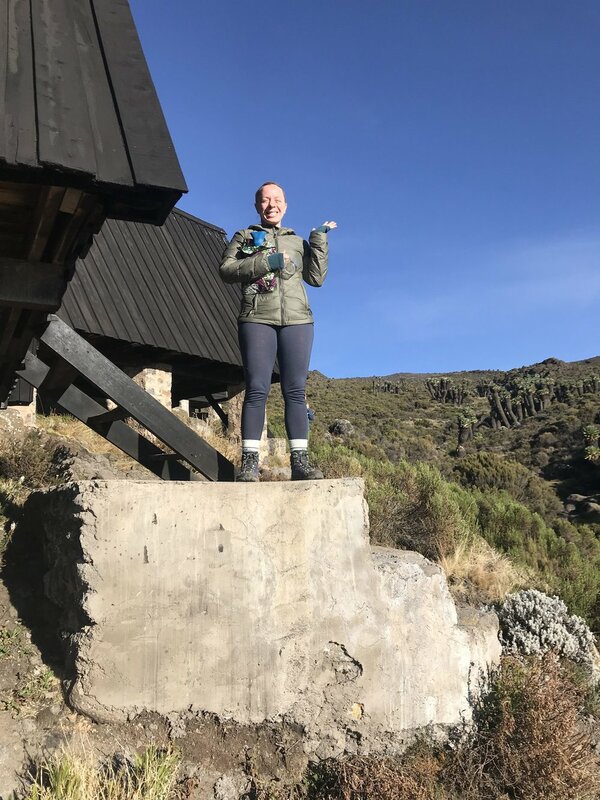 This hike was a few hours but really worth the views and the strenuous activity to give us a small taste of what Kibo huts would feel like and to give us another night of sleeping at over 14,000’ above sea level. We had a really nice group hike up there with most of the Swiss groups following or trailing us (which was normal the entire trip to have these groups around us but not right up on us) and then came back for a late lunch, relaxing, and then some card games in the afternoon before dinner. Horombo huts! Now at 14,000’ above sea level. The hut that Karlie, Zoe, Lisa and I slept in for 2 nights at Horombo. That step was super steep and right at the end of the concrete was as drop off into a ravine. Going to the bathroom at night absolutely required good balance, the headlamp, and a buddy. 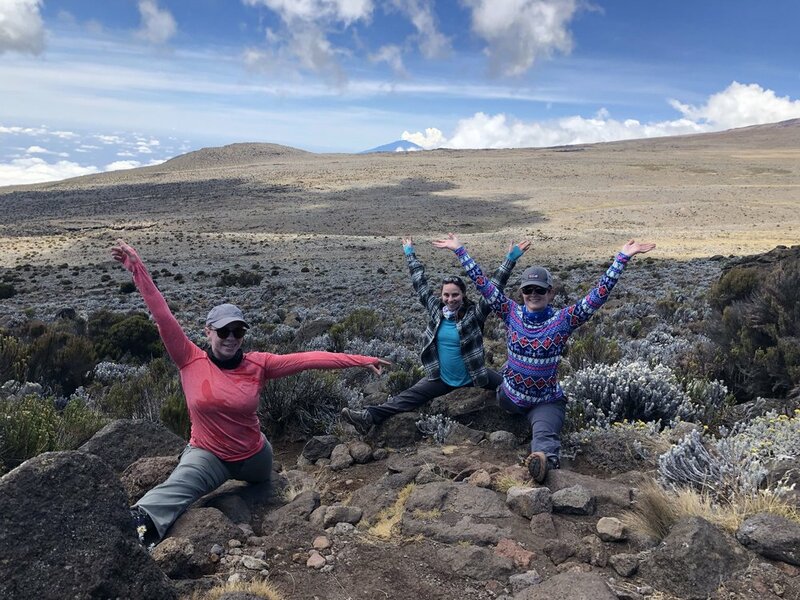 Splits in Kilimanjaro National Park with K and Z.
Acclimation hike views above Horombo Huts of Uhuru Peak, our summit destination. Posing with Mawenzi peak in the background. Acclimation hike above Horombo with Mawenzi in the background. Most of our crew above the clouds on the acclimation hike. 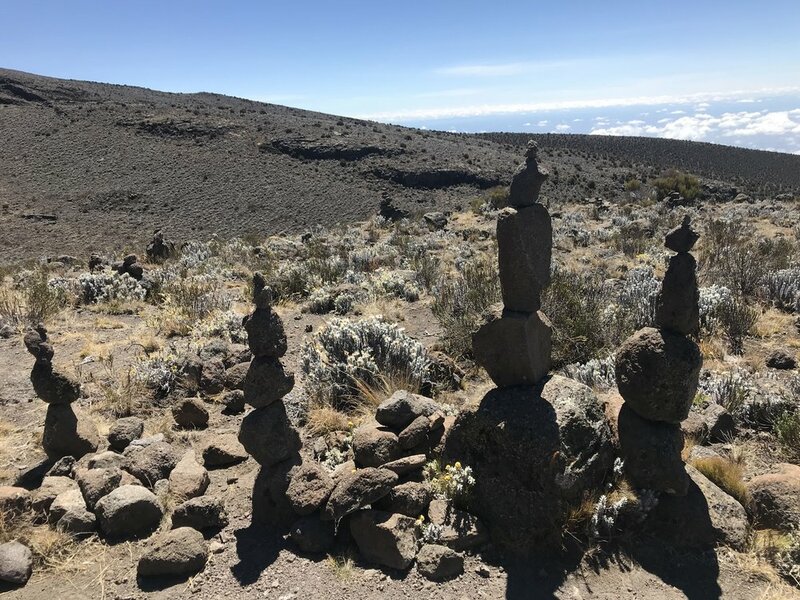 Cairns at Zebra Rocks, one of our destinations on the acclimation hike from Horombo. 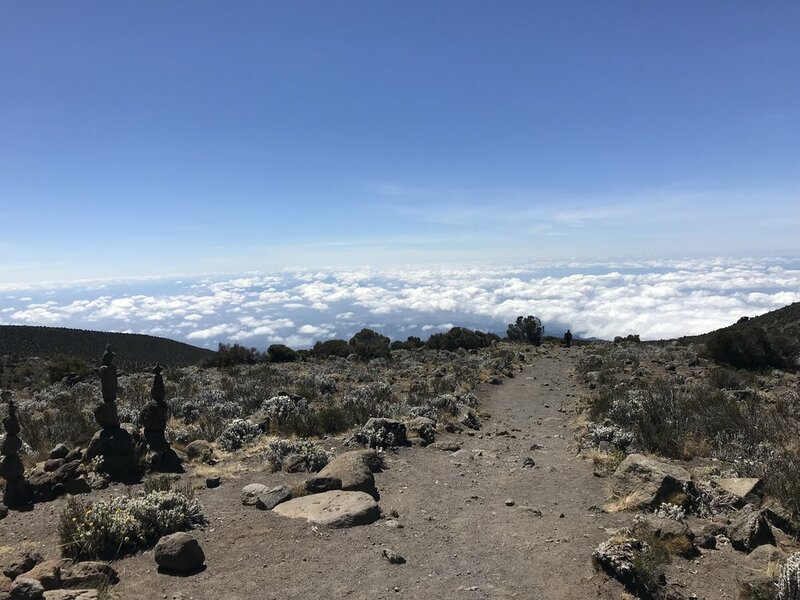 Above the clouds and above Horombo Huts. Taking a rest at the tip top of our acclimation hike that day and looking out below at the clouds. Posing way in front of the Zebra Rocks, one of our Swiss friends photobombed the side. After our dinner at our second night at Horombo, they did the usual vitals check, explained that we’d be headed to Kibo huts and to 15,000+ elevation for the next day (our 4th) and that we would be hiking slowly, as usual. 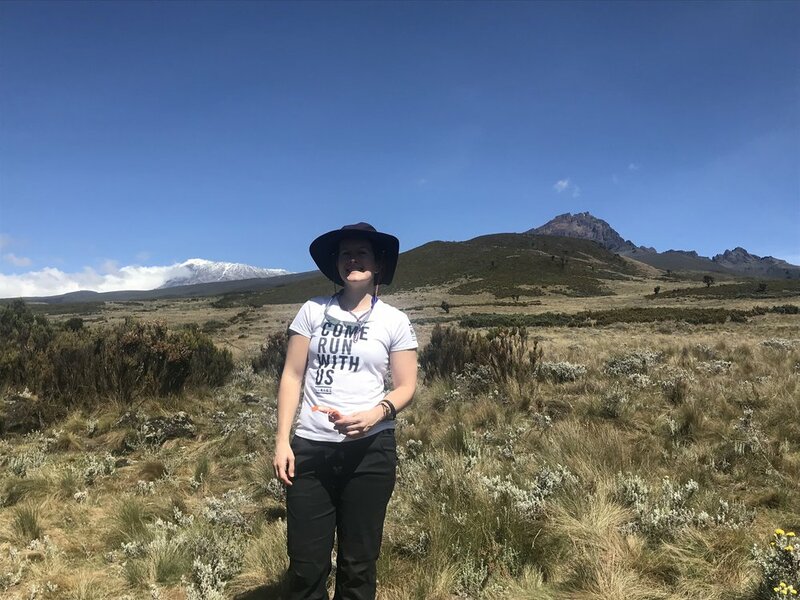 They also told us once we left Horombo, there was no more running water and that the porters and staff would be carrying all of the water we needed until we got back there in 2 days. That meant all the water for cooking, drinking (we had to have 3 liters on us at all times for hiking), and washing. This was for 8 hikers and 30 staff. That is a lot of water. The porters are so amazing and strong, they have to be able to carry up to 40 kilograms each, which is about 88 pounds. All 8 of us hikers are so indebted to them and the guides for successfully getting us up that mountain and back alive and healthy. I know that Kilimanjaro isn’t Everest, but it was still no cakewalk and is to be taken seriously. We woke up early for our hike to Kibo, packed up, the porters got our bags, and we set off for camp. The sign at Horombo says it is a 5 hour hike to Kibo from there and that was accurate with breaks and lunch. We were in the alpine desert pretty soon after we left Horombo and at times it was like we were walking on Mars or something. There were just rocks, dirt, and dust. And the clouds/fog rolled on and off the path, constantly blocking and unblocking our view of Uhuru Peak. It was desolate and since most of us were pretty tired by then and also kind of nervous about what was to come that night when we reached the camp, (summit day hike actually began at midnight) we were a fairly quiet bunch that day, aside from some jokes and laughs here and there. Zoe and I are Horombo at sunset, before dinner. One minute it was bright (on the way to Kibo). And the next it was not at all. We made it to the top huts! 15, 485’ above sea level. We reached Kibo, site of no water and no western toilets, and were assigned to our stone huts of 12 bunks. So 6 of us were in a room with our Swiss friends. John and Jody were in a completely separate bunkroom with another group of Swiss. It was weird. It was much colder at this elevation and the buildings were colder but built out of stone to keep us warmer. Greg, in our group, had trekked on part of the Annapurna trail in the Himalayas and said the huts at Kibo were similar to what he stayed in on that trip. The accommodations were fine, but overall, everyone seemed a little quieter and more tired and the mood was different and I don’t think the less comfy huts helped. It was noisier and we were much farther than we’d been in previous camps, from the outhouses (which were also down the hill). They smelled really bad (altitude sickness) and so everyone wanted to run away from them when they left them but if you ran at all you were out of breath in 2 seconds because of the incline and the altitude. It was comical and a good reminder to slow down. “Pole Pole” was something we heard all the time from our guides and staff (pronounced like po-lay) , it means slowly slowly in Swahili. We hiked at a very slow pace because that is really the only way to climb Kilimanjaro if you don’t live at a high elevation. Our first stop at Kibo was to sign in to the guest book, which we did at the start and at every camp. We wrote our name, country, passport number, and age, then we were assigned our rooms, told what the evening schedule was, and then ate an early dinner and had our vitals taken. We were sent to rest/sleep that night around 7 pm since we had an 11:15 pm wake up for the summit hike. The dinner that evening was lighter in fare, a lot soup and vegetables plus lots of tea and water. Not long after we arrived, I felt weird. I had a very dull headache and didn’t know what exactly I felt like, but I just knew something was off. I just thought I was dehydrated and had not been drinking enough water and was tired from being in the sun and wind. I’d been taking diamox (altitude medication) since we started the hike and I hadn’t had any sickness yet but I’d lost my appetite for the most part and had to force myself to eat dinner that night. I could not eat a lot but my vitals were normal and nothing was alarming. And that’s where I will leave you! The first 4 days of this hike were challenging, fun, and filled with great views, new friends, and fun bonding experiences. Summit day was a whole new ballgame and I can’t wait to write about it.